Your baby’s first year of life is an amazing time, filled with discovery and enormous growth. The impact this first year has on his future is tremendous and we strive only for the best. 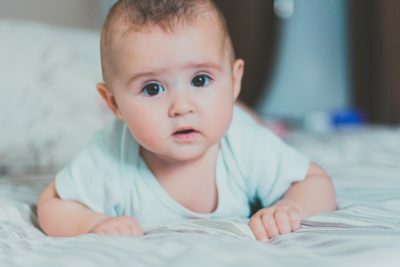 It can be difficult to leave your infant in someone else’s care and be confident that he will get the same care and stimulation you would give him. Fun-N-Fit’s Infants Program will give you the peace of mind you need. We will take care of his or her daily needs, following the daily schedule you give us each morning. We also provide age-appropriate activities to promote cognitive and social development. Our highly experienced infant teachers build a bond of trust with your baby and with you. We provide a warm, nurturing environment allowing your baby to be comfortable enough to build self-confidence in himself and develop positive and trusting relationships. It’s the kind of infant day care environment where children learn best and flourish. When you choose Fun-N-Fit, you can be at ease knowing you have chosen a warm and calming environment, focused on continuous positive social development. Starting at birth, we provide a daily routine that mimics your same schedule at home. Our highly experienced teachers build trusted relationships with both your baby and you; open communication is our key. At enrollment, and each morning, parents complete an informational sheet that will tell our loving and attentive teachers how to best care for your infant. We ensure the room is flexible to the needs of your individual child. We’ll also stimulate your baby’s cognitive, emotional and physical development by our daily activities. We guarantee the greatest child-care environment possible where children learn best and flourish as individuals. Our experienced teachers take care-taking and twist it into a teaching opportunity, basing their lesson plans on your child’s unique individual needs and developmental level. Activities focus on skills linked to large- and fine-motor development along with cognitive, social-emotional and language development. Some of our daily activities include: one-on-one affection, walks in the buggy, songs and stories, sensory activities, tummy time, personal care, meals, and outside time when the weather allows. Developmental toys are accessible within the child’s reach. Time in restrictive equipment, such as, swings, exco-saucers, and bouncy seats is limited to a minimum. You will receive a daily log of your child’s feeding, sleeping, diapering and learning activities. Teachers also perform assessments twice a year using developmental checklists.